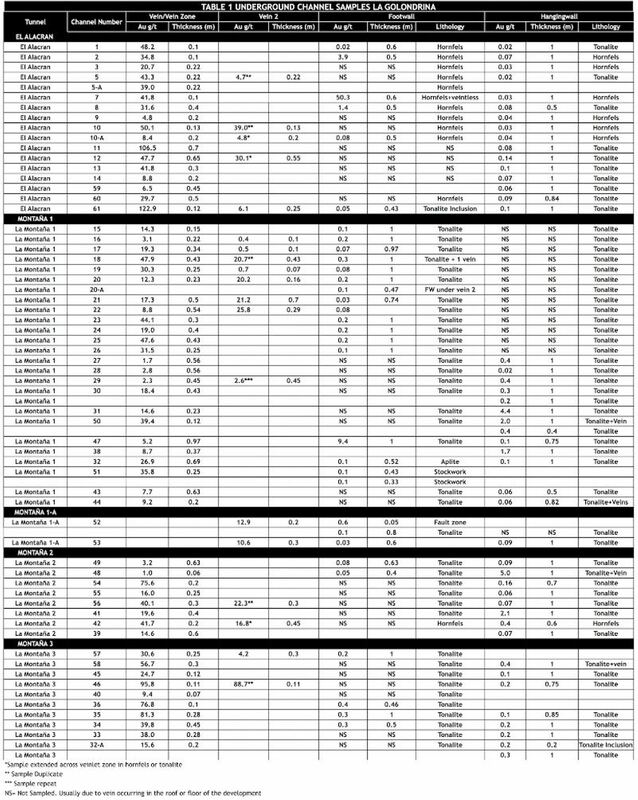 Toronto, Ontario--(Newsfile Corp. - March 1, 2016) - Royal Road Minerals Limited (TSXV: RYR) ("Royal Road Minerals" or the "Company"), a gold focused mineral exploration and development company, is pleased to announce results from sixty saw-cut channel samples taken from currently active underground workings at the La Golondrina gold mine in Colombia. La Golondrina is a small-scale, underground gold mining operation located in the prolific La Llanada gold mining district of Nariño province in southern Colombia. La Golondrina comprises multiple levels of historic, mostly horizontal underground mine developments which have accessed surface exposures of dominantly shallow-dipping high-grade quartz-veins (see Figure 1) and vein zones over a known vertical extent exceeding 400 meters and over an aerial extent of approximately 600 by 800 meters. Mining at La Golondrina was conducted manually up until some four years ago when electricity was provided to site. Air-leg drilling commenced at the El Alacran and Montana tunnels located at the top of the La Golondrina hill (see Figure 1). These tunnels remain active and are currently the only accessible underground exposures of gold mineralization at the project. Work has commenced on opening some of the older collapsed workings further down-hill and below the El Alacran and Montana tunnels. Mineralization at La Golondrina is part of a regional Oligocene-age intrusion-related gold system. Gold mineralized quartz veins, vein zones and stockwork veinlets are hosted in a tonalitic intrusion and extend outwards from that intrusion into a Cretaceous age, variably metasomatized (hornfels), marine sedimentary sequence. The Company has an option to earn a 100% undivided interest in the project (see Press Release October 7th 2015). To-date there has been no drilling conducted at La Golondrina. Management of the Company believes that there is an opportunity to define a significant high-grade plus million ounce resource at the project and to rationalize, modernize and expand the current operations. The Company has completed a saw-cut channel sampling and mapping program on four active underground mining levels at La Golondrina. The aim of this sampling was to confirm the high-grade nature of vein-hosted gold mineralization and to test vein zones and vein stockwork zones in the host-rock outside of and adjacent to the main vein bodies. The results from all sixty saw-cut channel samples from the El Alacran and Montana adits (See Figures 1 and 2) have now been returned (see Table 1). Vein samples across all active workings average 31.1 g/t gold (highest grade 122.9g/t gold) over highly variable but average vein widths of 0.3 meters (thickest vein 0.97 meters). In some cases sampled veins form a part of vein zones that extend from and into the floor and roof of underground development and over vertical widths exceeding 2 meters (see Figure 2 and channels 10A, 12, 20, 21, 22, 42, 57 and 61 in Table 1). In most cases it is not possible to complete meaningful grade estimations over these vein zones as vein components often extend and disappear into the roof or floor of the underground development. 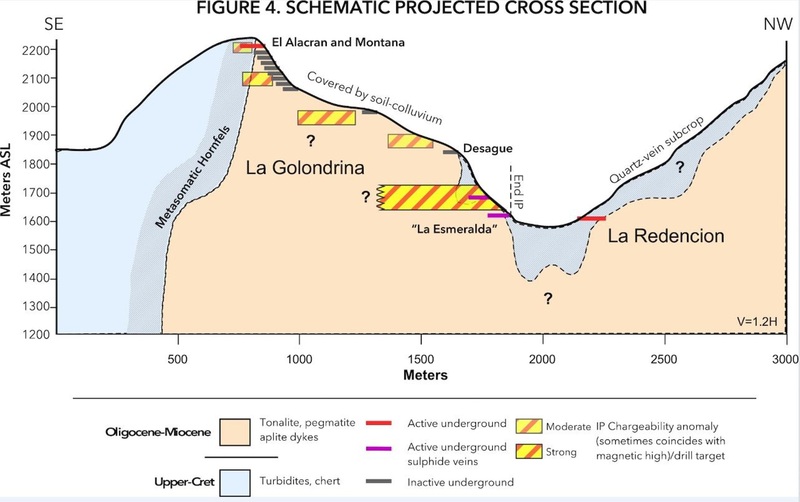 However, in the case of the vein zone illustrated in Figure 2 (channel 21 from La Montana 1) the weighted average gold grade is 11.8g/t gold over 2 meters. The best channel intersection to date across a vein zone is 21.7g/t over 2.2 meters from channel 12 in the El Alacran tunnel. Where vein and vein zones extend into hornfels altered sedimentary rock adjacent to the tonalitic intrusion, they generally disaggregate into stockwork veinlet zones which sampling reveals can return weighted average grades of 43.0g/t gold over 0.7 meters and 12.9g/t gold over 1.25 meters (see channels 7 and 42 in Table 1). It is noteworthy that the estimated width of weighted average intersections across vein zones or hornfels hosted stockwork zones is limited by the height of underground development and can only truly be tested by drilling. 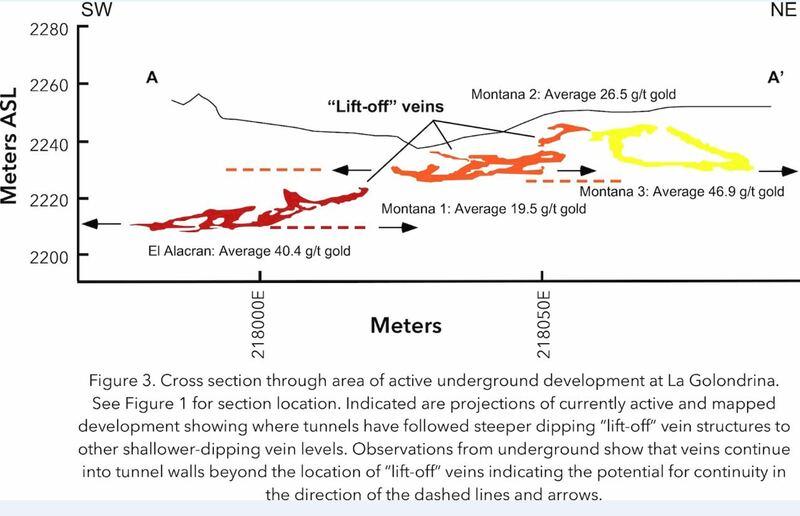 Underground mapping reveals that generally shallow-dipping individual veins and vein zones in the El Alacran and Montana tunnels can be connected between development levels by steeper-dipping "lift-off" veins resulting in a general step-wise shallowing of underground development and at-least four vein-zones towards the northeast and over a total known vertical distance of approximately 40 meters (see Figure 3). 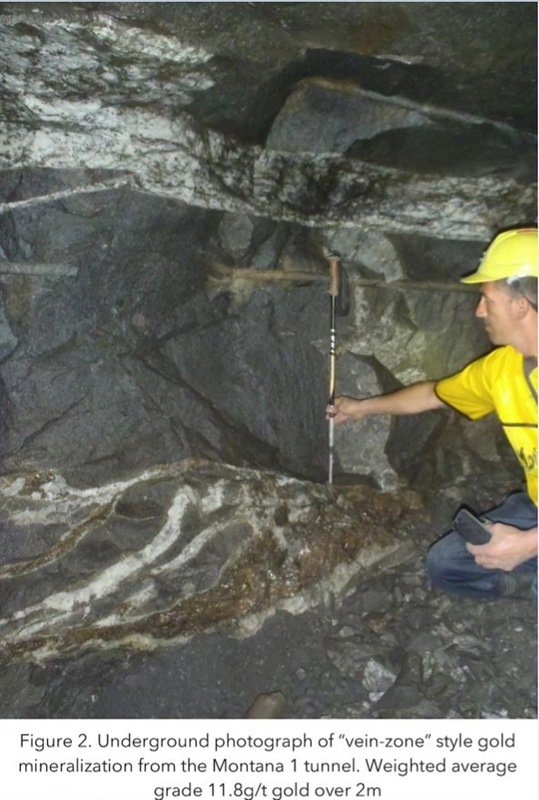 Observations from underground show that shallow-dipping veins and vein zones do not always terminate at "lift-off" veins but continue into the wall rock beyond them suggesting that they may extend above or below other currently active levels (Figure 3). 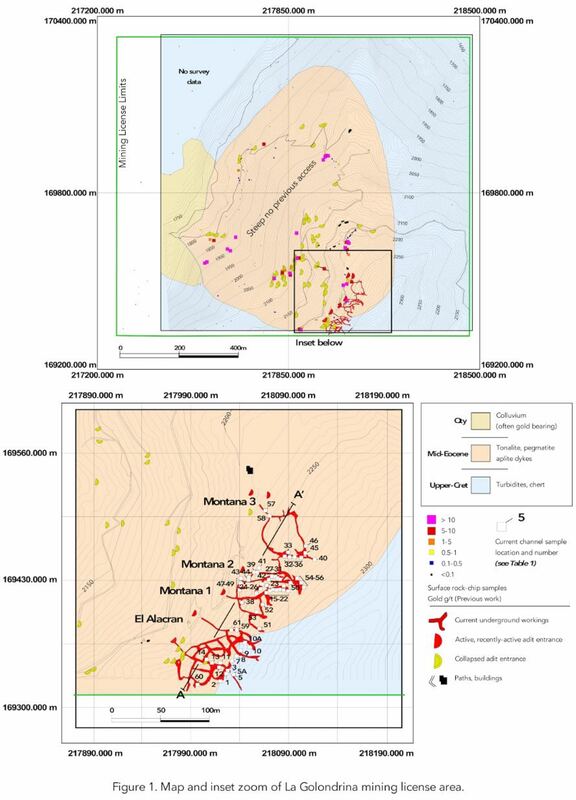 Importantly, these observations have been made in the only accessible area of underground workings and in a small vertical interval of just 40 meters which is open along strike and comprises less than 10% of the vertical extent of known gold mineralization across the La Golondrina license area. Dr. Tim Coughlin, President and Chief Executive Officer of the Company, stated "These gold results are encouraging and in line with what we expected, they will help us with resource statistics once drilling is complete. However, the observation of a linked vein system from underground exposures at La Golondrina is an important one that adds a new exciting element to the previous stacked and sheeted horizontal vein model. This observation effectively opens up the potential for steeper-dipping gold mineralized shoots, or "lift-off" veins between shallower dipping vein and vein zone bodies across the project area. In effect, this may mean that the 40 meter interval defined by currently accessible workings is in itself a "vein-zone" and that smaller-scale vein-zone geometries such as those observed in Figure 2, may reflect the larger-scale structure across the entire license area. Naturally this model can only be tested with drilling. Inter-vein areas in vein zones often contain disseminated pyrite and veins themselves can contain magnetic pyrrhotite which means we should be able to combine our geological knowledge of the area with the IP-geophysics and ground magnetic datasets to help site drill holes. If we add the nearby La Redencion project into the equation, where we have an exclusivity arrangement to conduct due diligence, then the overall vertical extent of the gold mineralized system at La Golondrina to Redencion may be some 700 meters. We have illustrated this concept in the schematic section shown in Figure 4." Figure 3. Cross section through area of active underground development at La Golondrina. See Figure 1 for section location. Indicated are projections of currently active and mapped development showing where tunnels have followed steeper dipping "lift-off" vein structures to other shallower-dipping vein levels. Observations from underground show that veins continue into tunnel walls beyond the location of "lift-off" veins indicating the potential for continuity in the direction of the dashed lines and arrows. This news release may contain certain information that constitutes forward-looking statements. Forward-looking statements are frequently characterized by words such as "plan," "expect," "project," "intend," "believe," "anticipate" and other similar words, or statements that certain events or conditions "may" or "will" occur and include statements regarding the resource statistics, the La Redencion Project and the option agreement. Forward-looking statements are based on the opinions and estimates of management at the date the statements are made, and are subject to a variety of risks and uncertainties and other factors that could cause actual events or results to differ materially from those projected in the forward-looking statements. These factors include the inherent risks involved in the hiring and retention of directors and officers, exploration and development of mineral properties, mine site planning and development, the uncertainties involved in interpreting drilling results and other geological data, fluctuating metal prices, permitting and licensing and other factors described above and in the Company's most recent annual information form under the heading "Risk Factors", which has been filed electronically by means of the Canadian Securities Administrators' website located at www.sedar.com. The Company disclaims any obligation to update or revise any forward-looking statements if circumstances or management's estimates or opinions should change. The reader is cautioned not to place undue reliance on forward-looking statements.